There’s nothing subtle about KOKOKO! The Congolese music and art collective, now in the middle of their first American tour, are an all-caps exclamation of the Congo’s capital, Kinshasa, and its burgeoning alternative music scene. The country’s tumultuous political climate has sparked a radical disregard for the past and a wholesale embrace of the electric, effervescent future. The multi-disciplinary collective, which tours with five members but has many more at home, was born out of a confluence of musical styles both indigenous and foreign. The project began in earnest in 2016, when French producer Xavier Thomas, who performs under the moniker Debruit, came to Kinshasa to work on a film about the city’s art scene. Debruit has made a career out of exploring and amplifying various music scenes from across the world, including explorations of Turkish psychedelia and Nigerian electronica. Debruit describes his first night in Kinshasa as a night of radical, mind-expanding musical discovery. Kinshasa is a city of musicians, he says, and the music of the streets is inescapable. Debruit says that same raucous energy was everywhere he went in the city, but it wasn’t until he attended a show at an artist compound in the Ngwaka neighborhood that he found the first of his future collaborators. The musicians he met there were inventive and omnivorous, combining the industrial and punk-funk music of 1980’s New York City with a carefree melodic improvisation that was all their own. Though many of the musicians there would become involved in KOKOKO! in one way or another, Debruit found the core of the group in instrumentalists Love Lokombe, Dido Oweke and Boms Bomolo. But it wasn’t just the group’s music that shocked Debruit. The instruments themselves were avatars of inventiveness, fantasy contraptions cobbled together from street junk and spare parts and tuned to sound like the instruments they heard on the radio. There were typewriter kickdrums and cassette-player talkboxes and creations with no real-world counterparts; instruments born out of the necessity of being heard in a city full of sound. With a population of 11 million, the city sounds of Kinshasa creates its own musical masterpiece, from the clinking bottles of street sellers to the hawking calls of taxicabs. For musicians like KOKOKO!, co-opting these noises can help them feel like their voices are being heard above the din. After meeting the Ngwaka musicians, Debruit said he spent the first few rehearsals on the sidelines, immersing himself in the musical language of this new world. The more he performed with them, the more he found his own musical practices changing. 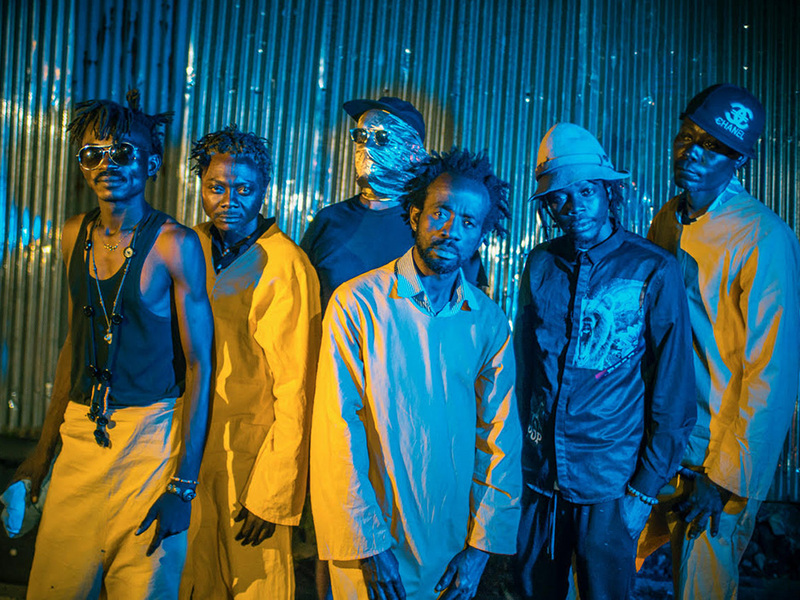 With the melding of Debruit and the Ngwaka musicians, and the band’s instrumental groundwork set, they ventured to the Lingwala neighborhood in search of a frontman. It didn’t take long for them to find one in Makara Bianko — a coupe-decale-style singer known as the “Lingwala Devil.” His tireless energy and insane performance schedule, rehearsing for hours each day, performing six nights a week at clubs throughout the district, made Bianko a perfect fit. Bianko brought with him a host of new dimensions for the band. There were the dancers he performed with, who soon became staples of KOKOKO!’s live act, along with his trance-like musical style, which consisted of electronic dance loops that Bianko would sing over with repeated vocal phrases. Most important, though, was what Bianko called “zague”- a searing, seemingly boundless punk energy that informed both the band’s music and their message moving forward. It’s not just the noise of Kinshasa that threatens to overpower individuals. The specter of silenced voices looms large in the city’s past, from the authoritarian censorship of deposed dictator, Joseph Kabila, to the mafia-esque control of the music industry by popular rumba musicians. Young radicals like the ones in KOKOKO! have never known what it means to be able to speak freely. It’s this atmosphere of paranoia and exploitation that KOKOKO! rally against with every facet of their being. From their upcycled instruments and incendiary lyrics, to the open and democratic nature of membership, the band fights the divisive rhetoric that is all too common under authoritarian rule, through a commitment to inclusive, all-encompassing joy. That joyousness was on display at KOKOKO’s first live performance in 2016 at a block party in the Ngwaka neighborhood, which was captured in the band’s introductory video, “We Are KOKOKO!” Debruit describes it as an all-out party, with people dancing on roofs and in the streets. Although their world is often oppressive, the video is a testament to the power and willpower of the people of Kinshasa. That’s what KOKOKO! is about, more than anything else — how righteously powerful self-expression can be when everything outside of the self is uncertain. And while the feelings expressed may be born of frustration or fear, the catharsis of release is more important than anything else. They know the world is oppressive, exploitative and more often than not, downright cruel, but that doesn’t mean they can’t party. Click here to explore Las Vegas, NV on Culture Collide.